I have been having so much fun with these. 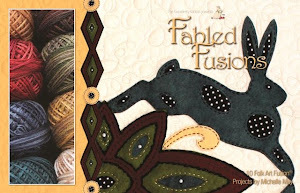 Here is a sneaky peeky of a new Folk Art Fusion design, which will also be a class. It's called, "Love Grows." I love these colors so much! 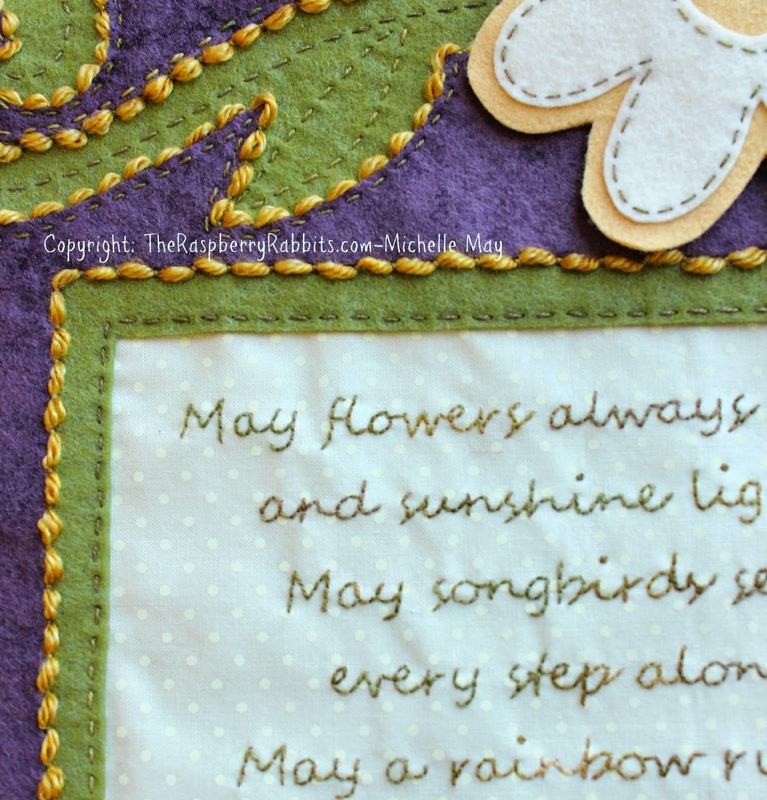 Then, here is a sneaky peeky of our April Blessing, which will be available on Thursday. I will have 24 Complete kits available and that's all, so if you want a kit, don't delay. So what have you been up to? Do you have Spring fever? 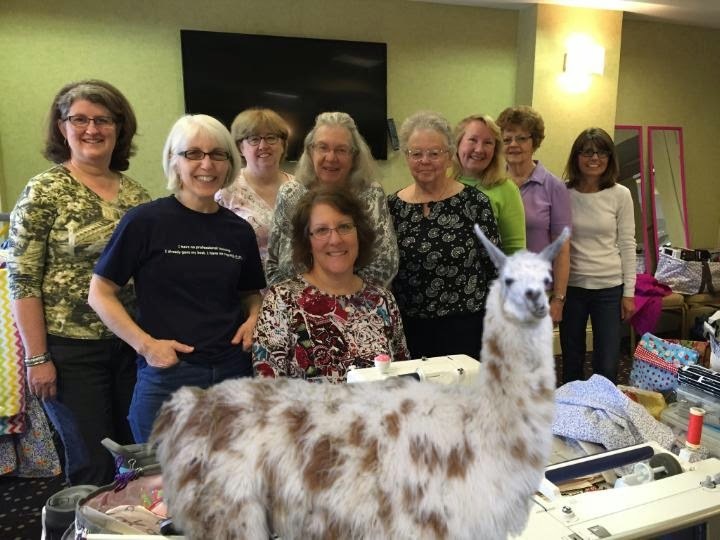 You're sewing with a Llama? You know how much I dream of living in Wilmington, NC right? Well, my good friend, Jean invited me to visit with her and some of the girls from the Wilmington (Cape Fear) Chapter of the American Sewing Guild. They were having their spring retreat. It was a most wonderful day with these fun ladies and I took lots of photos to share with you. We even had a special visitor. Here he is wanting a kiss. 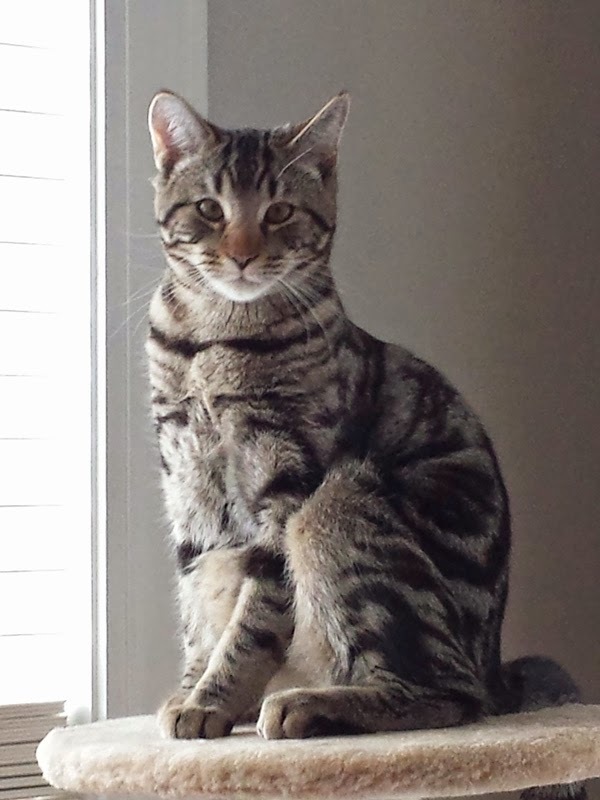 More on this fella later. So let's hop to some show and tell! This is Lois with her sea life quilt. Isn't it gorgeous? All the blocks had lots and lots of raw edge applique. So much detail in each one. She also made these darling smocked dresses. Here is Penny with her row quilt. I love the pirate flag on the boat. was working on this butterfly. So pretty! and a bag(s). Jean made one of the bags. I really want to learn to make a shirt like this. It is Alabama Chanin style. I love it. It's made from jersey knit fabric. So soft. It will have lots of hand stitching in it, which is right up my alley! Jean also made this summer night shirt. Tammi's daughter is in dance and she likes her doll to have a matching dance outfit for the competition. So, Tammi designs and makes the outfits. So fun! I think she made some other things too, but I can't seem to remember. Ginny made this pretty tree skirt. Woo hoo for getting ahead for Christmas! Isn't this fabric adorable? It's stitch witches! LOL! Here Ginny is using it to make a fabric bowl. Julie is the queen of the scrap quilts. She and some of the other ladies make these quilts for the homeless. I think it's wonderful. The scraps are from left over bits and pieces that people donate. I think they are beautiful and give a lot of love and a warm hug where needed. She also made these scarves for cancer patients. Again, so very kind and generous. Michelle worked and worked and worked on this gorgeous blouse. It's silk! It even has a zipper on the back. Silk and a zipper!!! Major phobia....here. Great job Michelle! Woo hoo! This bag and the one below are made from pot holders! I love the cute little zipper tab on the sides. Ok, so now about our little llama visitor. Linda is the one who brought him. He made us laugh and laugh and laugh all day long. I was told he kept them up late last night too. 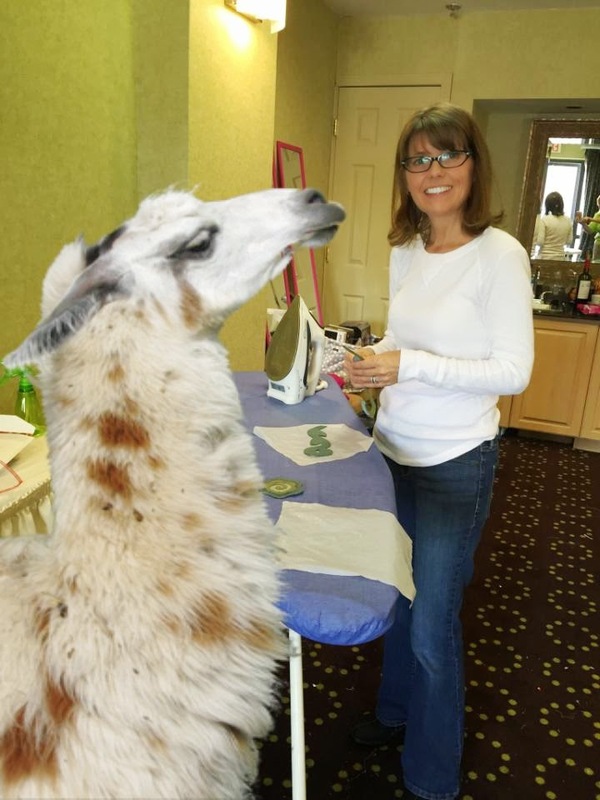 So are you wondering how Linda managed to get a llama in the hotel? Well...HE ISN'T REAL! He is just an app she got for her iphone. 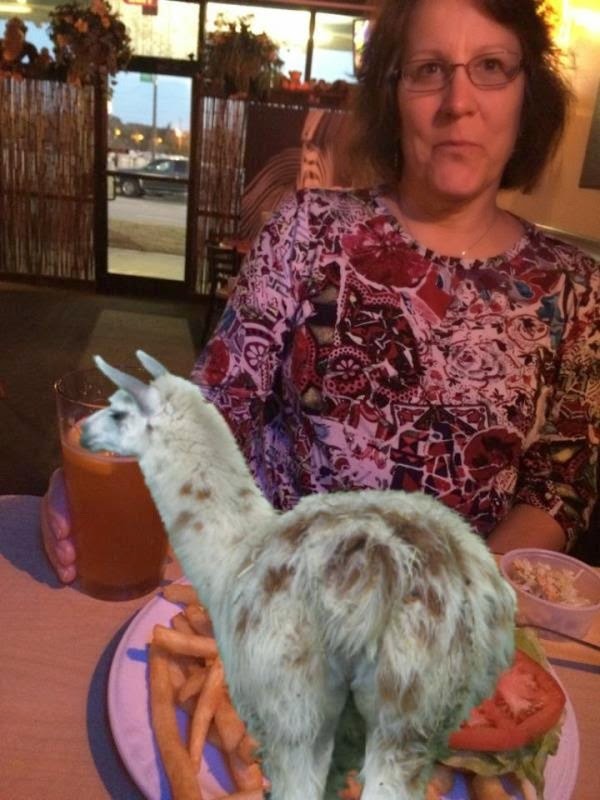 Basically, the llama can photo bomb any picture you want. Like this one where he his drinking out of Jean's class. hee,hee,hee. A good time was had by all. Especially this little bunny who wants to move to Wilmington. Well, I don't know if it was because our February meeting was canceled because of bad weather, or because we have all been stuck inside for months, or because we just ate cake, but this was one wildly fun meeting filled with great show and tell and a whole lot of laughter. Just what this little bunny needed to chase away the winter blues. Bonnie started us off with this cheerful tree quilt. You can't help but smile looking at this quilt. She also brought this fun quilt. I think the stitching really pops. inside was this crazy quilt! Wow! She also made a patchwork scarf. One member said it could be used as a prayers scarf. I laughed because I noticed the cross behind her. hee,hee,hee. Renee and her husband do Civil War Reenactments. Renee makes lost of different items to sell at the shows, such as these ladies hats. Linda showed this quilt she's working on. It's made from fabrics she found on the donation table. We all bring in bits and pieces of fabrics etc. and put them on a table. Guild members pick up what they like and leave a few dollars in a donation bowl. This helps our guild. It's a win win for everyone. this sweet little hexie coaster. Pam wowed us all with this beauty. I am in love with those colors. Soooooooooo gorgeous! Then she shared this bright happy quilt. Pam is our resident hand quilter/piecer. She does not own a sewing machine. Everything is by hand! Cool huh? Charlene showed a snowman book her friend Holly gave her for her birthday. Charlene does love her men. ;) We will be having a snowman block exchange later this year. I think it's going to be lots of fun. Our lovely Minnesota friend, Marly, showed us her Bertie quilt. Marly also gave a really great program on some easy magic blocks and ways to add a some wonderful treatments to bindings and borders. I forgot to get photos again. Dag nab it. Marly also showed this gorgeous needle felted table mat. She has a needle felting machine. So do I, but it has yet to be removed from the box. Nice. Kathie had us all laughing so hard as she told us the story of how this little quilt tried to get to the library display, but never made it. We all gave her a round of applause for her effort. She makes me laugh all the time. It's impossible to be sad when you are around Kathie and her fun energy. Suzanne was super busy during her snow days! She made all of these kids quilts for charity. She is amazing! My dear friend, Peggy, showed us this gorgeous bouquet of fat quarter roses. We might have a demo on these at a future meeting. Bunny ears crossed! Julie showed us this really fun modern quilt. I love it. She pointed out how simple the border is. Great colors too! Loleta is a total riot. She has a big southern accent so imagine her saying, "I made this quilt big because my husband and I are big people." Then she said, "It's so heavy it makes your toes bend down under it." We all died laughing. Jackie shared her friendship star quilt from the swap we did last year. this puzzle quilt. She got a lot done on her snow days too! Sandy shared her child donation quilt. I love these critters. I have to make some of them. They are so fun. Gerri shared this beautiful table topper. 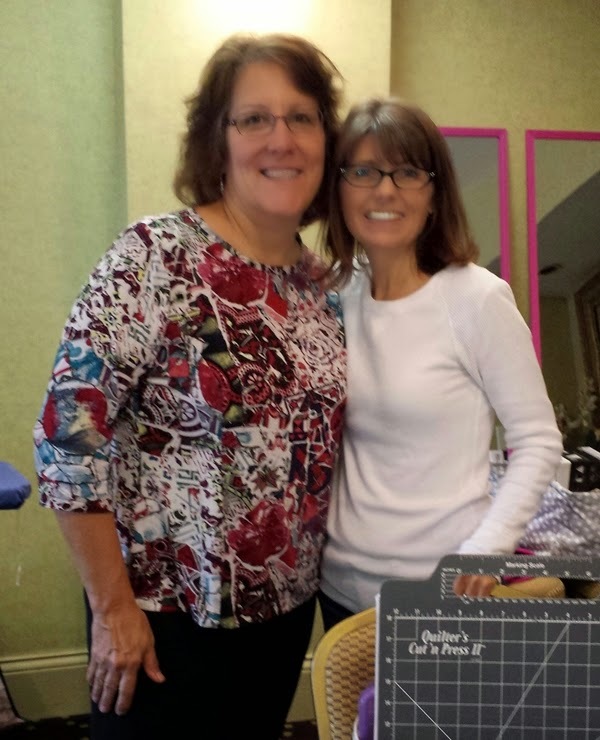 Gerri and I are in a stitching group which tries to meet once a week. Last week we met at her house. Then Gerri wowed us with this. It was a block of the month from a store in New Jersey. She said some of the pieces were a little challenging. I think it is gorgeous. Her daughter works for West Elm, a furniture/accent store. This totally looks like something I could see draped over a chair or bed in one of their catalog adds. Again, just say'in. Gerri also made this little lamb pincushion. Isn't she cute? Our president, Vicky, brought the evening to a close with this drop dead gorgeous quilt. She said this was a class she took at the North Carolina Quilt Symposium many years ago. She was determined to get it finished. She said she used every last scrap of the fabric to complete it. I think it is incredible and the quilting she did is stunning. Vicky is one of our resident long arm quilters. 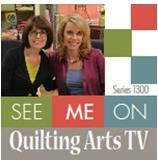 Thank you girlfriends for allowing me to share your quilts with friends around the world. Quilting brings us all closer together. It's our day to play on the Tree Bird Blog Hop! 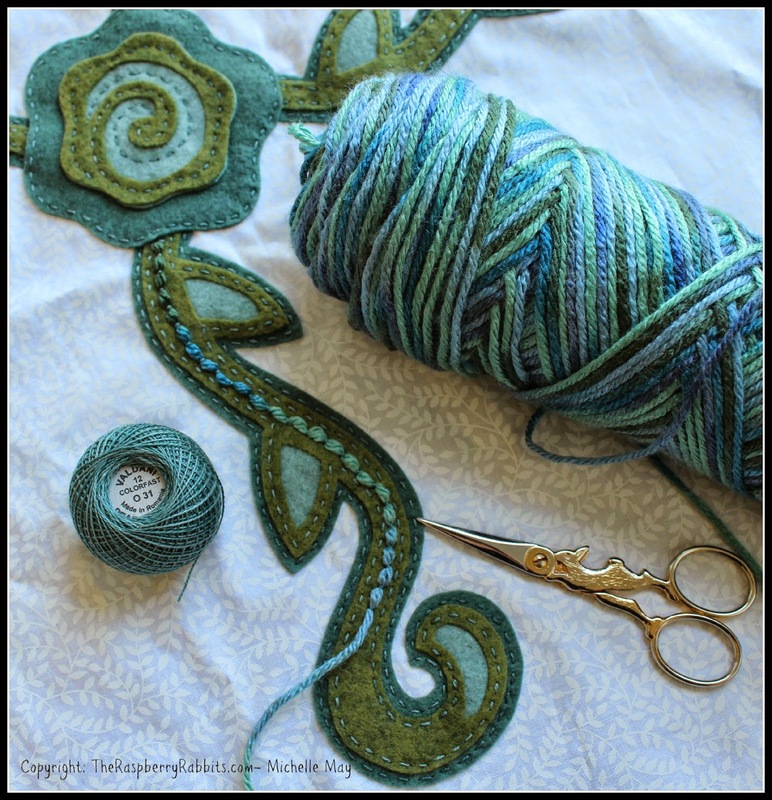 Tree Bird Blog Hop Day ! The Tree Bird Hop starts tomorrow!